A man who spat at his ex-girlfriend during a five hour long ‘psychotic episode’ has received a suspended sentence. Brendan Harkin, of Park Avenue, was convicted of common assault and causing damage to a door lock on November 11, last year. Derry Magistrate’s Court heard the injured party was in bed sleeping when she heard a loud banging. She got up and found the 49-years-old in her home and that the locking mechanism of the front door was damaged. Harkin had opened a bottle of wine, poured himself a glass and was drinking it. 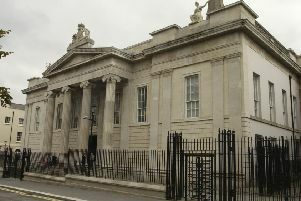 The injured party was not permitted to leave her home for the next five hours, whilst Harkin had a ‘psychotic episode’. He shouted at her and spat at her during this time and the woman was frightened because of their lengthy domestic history. During police interview, Harkin admitted forcing open the door but denied spitting at the injured party. He said it is accepted his client has relevant previous convictions and there is a history of domestic violence. Suspending a six months sentence for two years, District Judge Barney McElholm also ordered Harkin to spend 12 months on Probation. The judge also imposed a Restraining Order, which bans Harkin from having any contact with the injured party for the next six years.